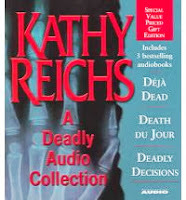 Another case of me kind of cheating on the "Canadian" designation, as Kathy Reichs is pretty firmly American, but she also works in Canada (Quebec, specifically) and the entirety of this novel is set in Montreal. So there. I claim this as a Canadian crime novel. And I liked it. I really did. It was also another case of me discovering after the fact that it was an abridgment, but in this case, with a few caveats, I didn't actually mind. I think the things that were missing were okay to be missing, with a couple of exceptions that I will get into in the following paragraphs. The production on the audiobook was excellent; Amy Irving as the reader was just great. She had the perfect voice, the perfect intonation, and the perfect pacing for Tempe's first person narration. I was hooked pretty much immediately and I fully intend to listen to the next book in the series at some point. Whether or not I listen to it abridged or unabridged remains to be seen. Abridged is much more accessible to me at this time, so I'll probably go that way. This is the first of the Dr. Temperance Brennan books, made somewhat more popular than they already were by the advent of the television series Bones. The thought of reading this appealed to my book club because it's a forensic mystery -- a genre we had yet to read from -- plus it has a Canadian connection. Dr. Brennan, or Tempe, is a professor of anthropology in North Carolina, and a forensic anthropologist on the staff at the Laboratoire des Sciences Judiciaires et de Médecine Légale in Montreal, Quebec. Tempe is called to go ensure that some bones found near an old burial site are in fact old human bones, but it doesn't take long for her to realize that they're not that old at all -- and the person the bones belonged to didn't die from any natural cause, nor did she end up in pieces by accident. Further, Tempe notices some alarming similarities between this body and another she examined not long ago. What started as a simple call leads to an increasingly tense murder investigation. Tempe can't seem to convince the powers that be that a serial killer might be at work; and even when she does, it turns out she might be his next target, putting those closest to her at risk. This is not a book for the faint of heart. The murders are grisly, over-the-top, sadistic serial killer murders, and the conditions the bodies are found in are very well-described. And this book employs my absolute least favourite murder mystery trope: This Time It's Personal. Further, the tension is ramped up heavily as we get towards the end of the story. So one would think that this book wouldn't be my cup of tea, with the least-favourite-trope plus heart-pounding-occasionally-gory-suspense-thriller. In the hands of a lesser storyteller, with a less fabulous central character, with less fascinating science, in a different setting, with a different reader, I'm pretty sure I would have put this one aside. But by the time it became clear to me where we were headed -- and when the foreshadowing got a little heavy-handed for me -- I was so interested in the whole thing I couldn't stop. In addition to This Time It's Personal, Tempe also suffers from a bit of Horror Movie Heroine Syndrome, in that she makes some really dumb decisions for reasons that are not explained in full but appear to be entirely driven by plot. I get that Tempe is a bit brash and hasty, and I get that she's fighting for acceptance in a man's world, but heading out to a possible body-dump location by yourself in the dark in a storm is stupid. Especially if the killer knows that you know where to go. A killer who has already indicated that he's targeting you. There are a couple of incidents along the same lines, which really stretches believability, or perhaps just patience, with Tempe's character. But she was also incredibly likable, and smart, and abrasive in that somewhat endearing way. She is close to her daughter, she is leaving a shaky marriage reluctantly, she loves living alone with her cat. Small issues with the fleshing out of Tempe's character are what makes me think I was missing stuff with the abridgement. Particularly towards the end of the novel, when I wanted to see Tempe reacting a bit more realistically to some of the awful things that have happened, I am wondering if there were things cut for abridging purposes that would have made Tempe a more well-rounded, psychologically interesting character; as it was, I liked her, but she didn't seem to even really think about certain things except perfunctorily, and they didn't seem to carry much traumatic weight. I can't discuss much further for fear of spoiling. I can fill in some of the gaps with my own imagination, but I'm not sure I should have to, given how well-written the book seems to be in places, and how rounded Tempe is in other matters. This bothered me as being lazy, an author wanting to have a sensational climax without having to give her main character suitable baggage for the rest of the series. Or possibly it's just abridged. So there you go -- a book I probably shouldn't have liked given some of the issues with it, but in the end I really did like it, and I'm looking forward to the next. Recommended for crime/thriller fans who like their science, but can suspend disbelief fairly handily when it comes to certain plot points. Her newer books are even better! And not as grisly I might add.